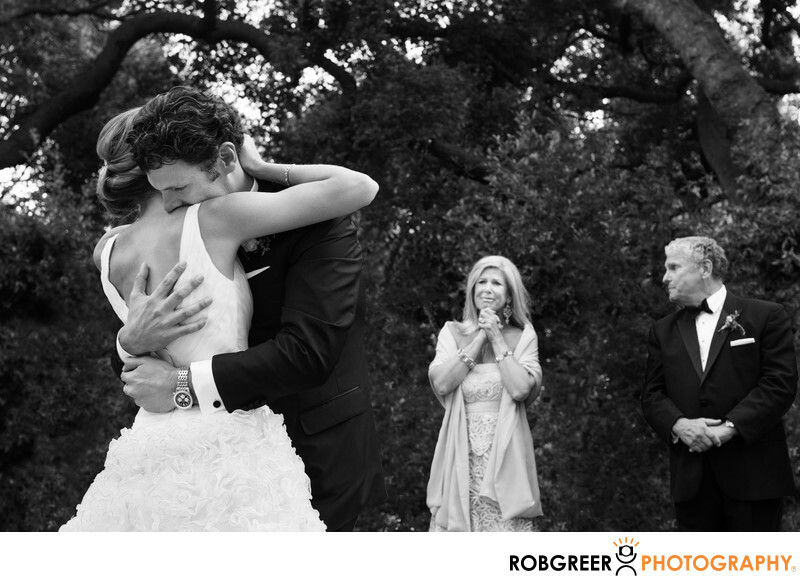 This candid moment that I captured as a wedding photographer photographing this first dance at Gardens of La Bella Vita in Montecito is one of my favorite photographs from 2012. As the groom holds his bride close, the groom's mother looks on with genuine love, adoration, and happiness. The groom's father, looks to his wife and appears to be soaking up her enjoyment of the moment. When you look closer at the photograph of this reception dance, you may notice the way the bride is clutching the back of the groom's neck. Subtle details like those seem to make an image like this even more real. Although Gardens of La Bella Vita are only available for a few weddings every year, I certainly hope that one day I will again be chosen by a couple looking for wedding photographers with experience at this venue. This photograph was recognized at the 2014 WPPI Print, Album & Filmmaking Competition with a second place trophy in the Wedding Party / Family category. That particular category is typically a difficult one as it is popular and wedding photographers from around the world will often choose it for their entries. I was forced to choose that category instead of photojournalism because I retouched this image to remove the best man and maid of honor from the background since they were partially obscured by the bride and groom. I also had to remove several light poles, microphone stands, and other equipment from the wedding band stage that was also in the background. I removed those objects because they distracted from a story present in the scene, and also because my style of photography is best known as being free of clutter and visual noise. Gardens of La Bella Vita are located in Montecito, California. Phone: (805) 680-3535. Website: http://thegardensoflabellavita.com. Location: 1115 Clover Lane, Montecito, CA 93108. 1/60; f/5.6; ISO 1000; 62.0 mm.